SCARY. A crazy Twilight fan's bedroom wall.. Wallpaper and background images in the Critical Analysis of Twilight club tagged: twilight critical analysis cat edward cullen vampire creepy. 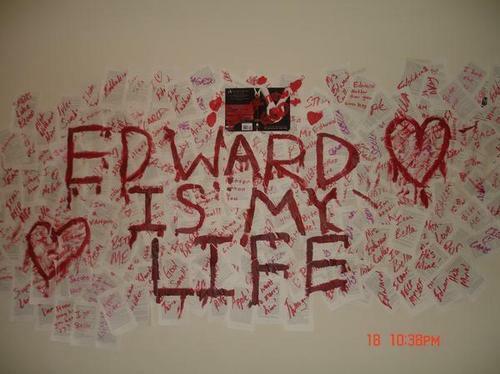 A crazy Twilight fan's bedroom wall. This Critical Analysis of Twilight photo contains sign, poster, teksto, and pisara. In Bella's words, "Holy crow!" What kind of person would do this to their bedroom wall?! I would hate to see THAT when I wake up first thing in the morning! WTF!!! I really hope that's paint. It's not paint. It's anti blood. Cullenism is taking over. Oh god, that is scary as hell! This is the scariest thing I've seen a Twi-hard do. *Shakes head* Those poor people...I actually feel BAD for this person. I pity this person, I really do. Because they're serious. And roobiip, you have no idea how much I respect you for being a Twilight fan and agreeing with us that this is just creepy. If your wondering where to draw the line from teenage obsession to unhealthy fanaticism THIS IS WHEN. Oh bloody... I'll get the Healers. ^ HP hint!! Hee hee hee!! I'd rather die then seeing this. are.. are those.. twilight pages?.. .O_O.. dude..
NO! I COME HERE TO LAUGH BUT I KEEP SEENG SCARY TWILIGHT OBSESSION!